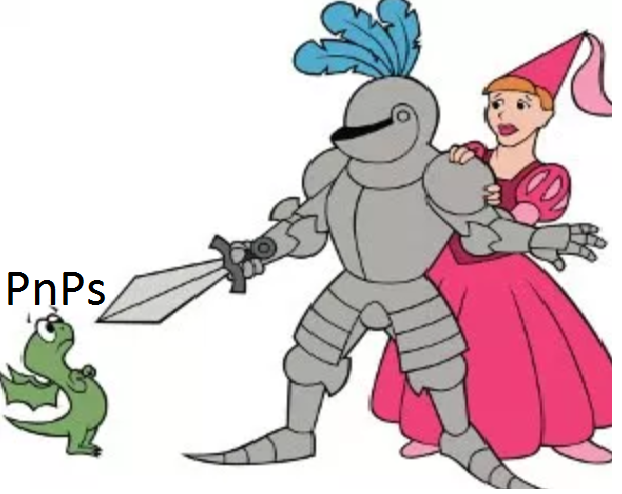 The " white knight" may not rescue the princess after all. 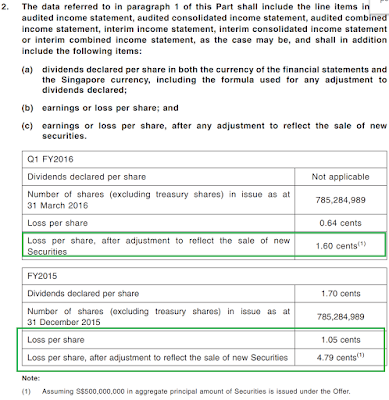 "Hyflux Ltd or Tuaspring Pte Ltd ceasing or threatening “to cease for any reason to carry on its business in the usual and ordinary course” is a “Prescribed Occurrence” within the meaning of the Restructuring Agreement." This is in response to PUB's recent announcement about the operational and/or financial defaults of Tuaspring which started since 2017. This "Prescribed Occurrence" allows Salim to walk away. So it seems not only retail investors are not fed material information before, even an institutional investor , who has the utmost complete advantage of resources and the benefit of the comprehensive court affidavits are not aware of such material information when doing their due diligence. But the above is not the point of this article. The point of this article is to discuss about Singapore Exchange's (SGX) listing rules. 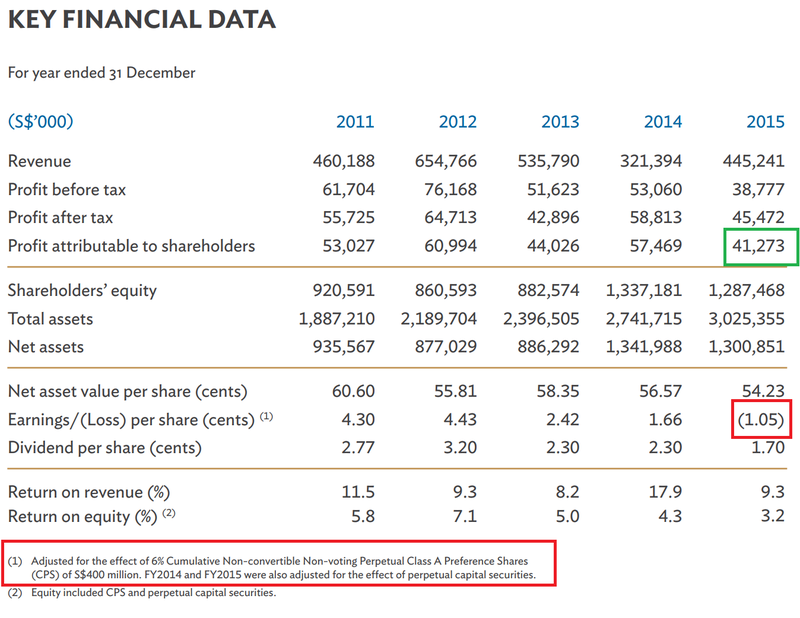 In particular, Practice Note 10.1 Shareholder Approval for Major Transactions. In short, a listed company has to seek shareholder approval when they enter into a new business outside their existing core business. The listing rule went as far as to state that even if the company is not entering into a new business and yet makes a transaction which will change the existing risk profile of the company, shareholder approval should still be sought. Before Tuaspring, Hyflux was in the water business. By taking on Tuaspring in 2010, building a power plant is the first for Hyflux. I hope you can see how misleading the power plant narrative was pitched " ...to provide an uninterruptible supply of good quality, clean energy to the desalination plant...". I also hope you can see how stunned investors were when it was recently revealed during court protection that 10% of revenue is from water and 90% is from electricity. Hyflux has actually entered into a new business ( electricity generation) that has drastically changed the risk profile of the company. To further elaborate my point, the power plant was completely unnecessary for the desalination plant to exist because Tuaspring operated without the power plant from 2013 to 2016. Tuaspring was taking electricity from the grid instead. In fact, the funny thing was, (USEP ) electricity prices was high in 2013 - 2015 and Hyflux was still doing well without the integrated power plant, despite needing to pay high prices to buy electricity from other generation companies. It was only when the power plant at Tuaspring went online in 2016 that losses started to mount. Imagine how profitable Hyflux would have been in 2016 ,2017 and 2018 since (USEP) electricity prices was at an all time low! Let us read the reply from SGX when this issue was brought up to their attention. I think SGX is equally misled as i was. "...objective of power plant ...was meant to supply electricity to the desalination plant." 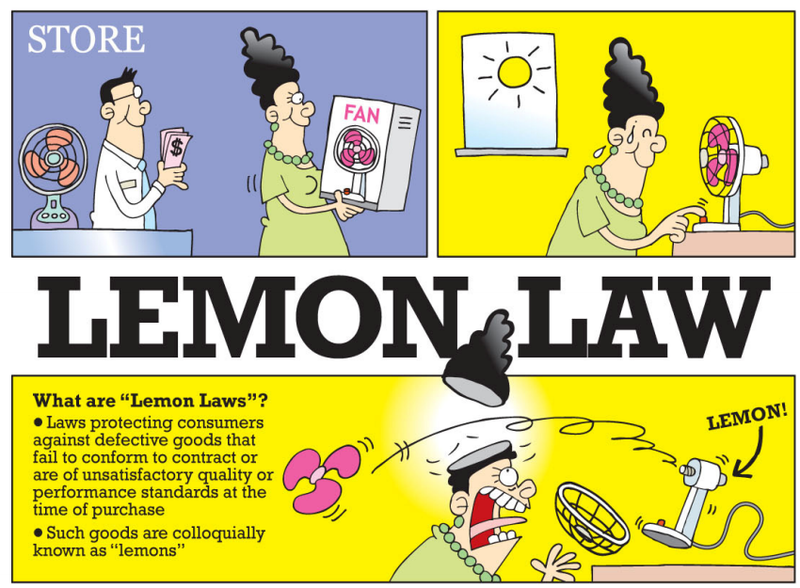 "...Excess power will then be sold to the power grid." As i wrote before, a 90% revenue from electricity does not reflect the objective of the power plant and also does not account for how an "excess' commodity can translate into such a high revenue. Naturally, i replied and stated my points about revenue again, just in case, this point was overlooked. **I am not sure if you noticed, this second reply wasn't addressed to MAS anymore. "...There was no change in the primary infrastructure business of the Company." 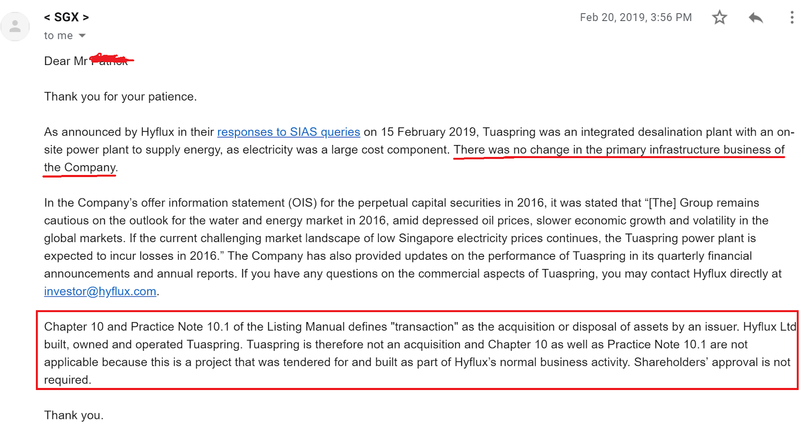 I was refering to the time when Tuaspring was conceived in 2010 and Hyflux certainly didn't pitch itself as an infrastructure business then which seems like a catch-all phrase. See my printscreen for the Annual report 2009 above again. The paragraph in the red box takes the cake. SGX defined "transaction" as acquisition. Since Tuaspring is built by Hyflux and is not acquired by Hyflux, this rule does not apply to Hyflux. I am not sure if SGX is being overly legalistic here. Doesn't building a power plant require acquisition of power plant turbines (reportedly SGD$800 million and from here also ) and other power plant components? Irregardless of whether they built or acquire, haven't the risk profile of Hyflux changed drastically which necessitated the point of requiring shareholder;s approval? Naturally, i thought it was ridiculous and if i am not a reasonable person, i would be thinking that SGX is defending Hyflux. Thankfully, i think i am a reasonable person and i think SGX is just being misled. My reply was a lengthy one, mentioning capital expenditure of power plant components in relation to the total project cost and market capitalisation of Hyflux during that time to illustrate how significant this Tuaspring " acquisition/built" was. ** MAS not addressed too. When SGX writes like this ".....we cannot determine or intervene in the commercial decisions of listed companies...", i wonder how they act as a front line regulator. And this phrase " commercial decisions" seems the vogue this days. Everyone seems to be using it.
" Shareholders........have been given the opportunity at AGMs to raise questions and clarify any issues that they may have...."
My interpretation is " your opportunity is gone now" and there is nothing we can do about it. Do you feel like there are adequate safeguards in place in Singapore to represent the retail shareholders? I certainly don't. For PnP and MTN holders who wants to vote NO but are unable to attend the voting on 5th April 2019. You can fill up this form to proxy others. This has to be done by 31 March since 2 April is the deadline to give the forms to Boardroom, a Corporate Secretarial Company and some leadtime is necessary for the volunteers. On 16 February 2019, Hyflux uploaded a court affidavit. In it, information about key projects were highlighted. It came as a surprise that three of the key projects was last audited on Dec 2016. Of particular note was the "elephant in the room", the project at the very heart of this saga, Tuaspring. 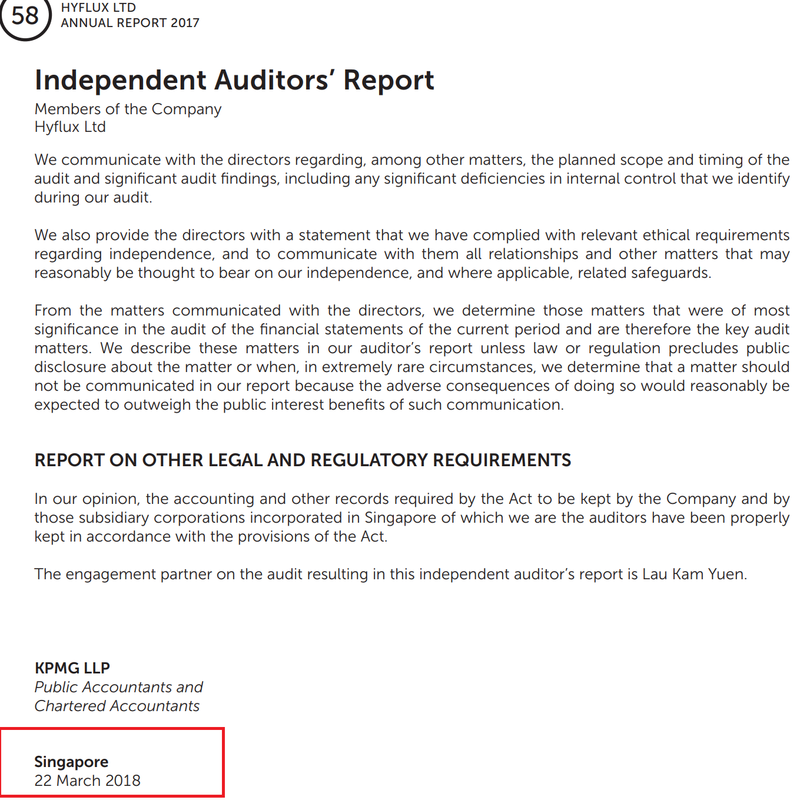 It must be noted that Hyflux's Annual Report for 2017 ( calendar year ending 2017) has been released and the accounts signed off by their auditor, KPMG on 22 March 2018. In the notes to the financial statements, KPMG also stated on page 142 of the annual report 2017. 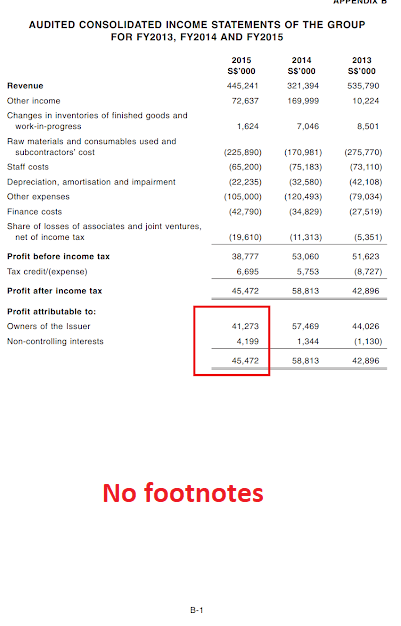 Take note that Hyflux Group only had $1 billion recorded as net asset value on on its balance sheet and a loss of $115 million in 2017 as stated in Annual Report 2017. This means that any of the 6 projects listed above are significant. 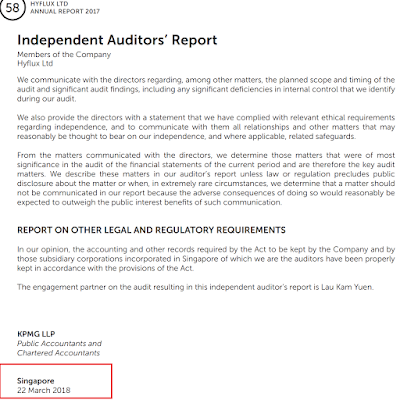 If substantial subsidiaries like Tuaspring, Tuasone and Tlemcen which together comprises of more than 60% of the total projects has not been audited for the year ending 2017, how sure can KPMG be about the true financial state of Hyflux when they signed off on 22 March 2018 for the Annual Report 2017? Can the Annual report 2017 be relied upon? I am unable to find any disclosure in the Annual Report 2017 that Tuaspring, Tuasone and Tlemcen was last audited in 2016 only. Is this a material disclosure which would have raised some alarms? The Public Utilities Board (PUB) mentioned that defaults at Tuaspring have started as early as 2017. It was also mentioned in the court affidavit on 15 November 2018 that PUB has step-in rights to take over Tuaspring. Since warnings have been issued to Tuaspring in 2017, why wasn't this disclosed in any way in the annual report 2017? 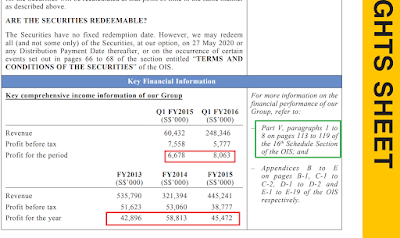 I was also unable to find in the offer information statement (OIS) of the $500 million perpetual securities or the annual report of 2017 that PUB had the right to take Tuaspring and at what cost? 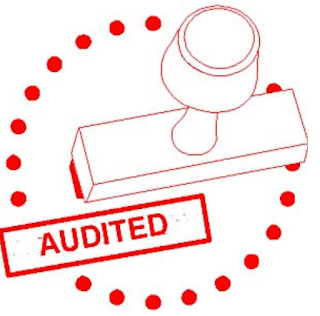 The audited financial statements for 2017 was signed off by KPMG on 22 March 2018 and barely 2 months later, on 23 May 2018 a court protection was called for. I wonder how long it takes for a company to survive before they are considered a going concern. For Hyflux, it seems 2 months is all it takes to be considered a going concern. There was already a material uncertainty existing in 2017 when PUB warned Hyflux about the defaults , hence casting doubts about Hyflux as a going concern. Why wasn't it disclosed? Did the annual report 2017 paint a true and fair view of the financial position and performance of the company? Another anonymous Telegram member shared the article " Total Compliance in Financial Reporting, But is it misleading?" An illusion of recurring, steady profits is shown as Hyflux is allowed to recognise financial receivables/intangible assets as profits over the 20 to 30 year concession period. This has the effect of "smoothening" the profits. 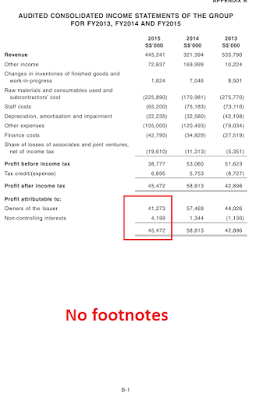 However, this had no link to cashflow. An illusion of low debt is also shown as Hyflux is able to classify PnPs under equity instead of under liabilities, hence enlarging the equity base and reducing the liability base. The Edge gave any example in 2014. showing the net gearing of 51% is shown but it should "actually" be 326%. 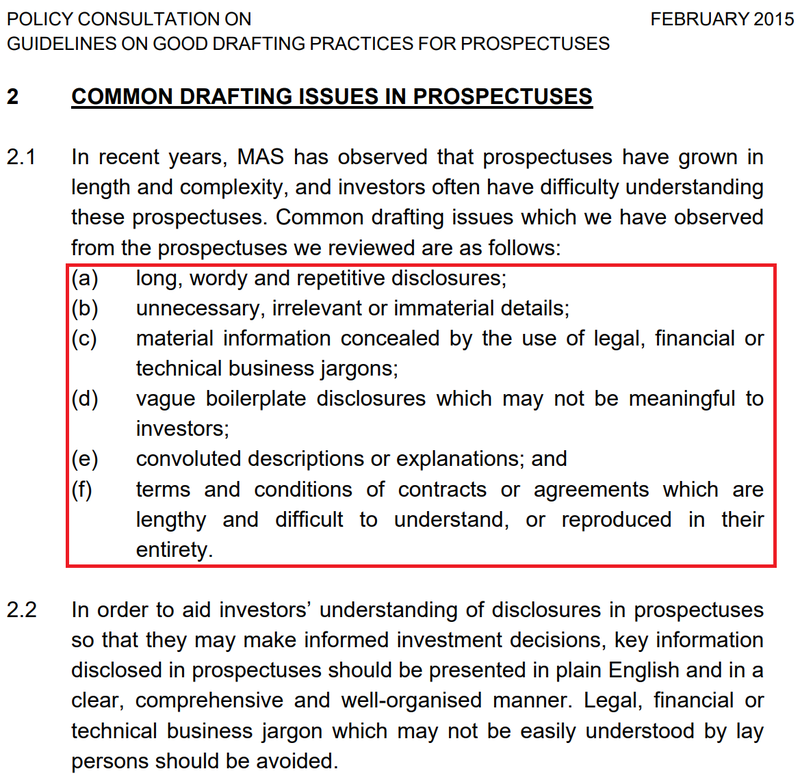 Whatever happened to the seemingly applicable " MAS Proposes Guidelines to Use Plain English in Prospectuses" whose purpose was to facilitate investors' understanding of key information disclosed in prospectus? Within one year from issuing the guidelines by MAS , in 2016, the perpetual securities are issued to mom and pop investors who can gorge at it through the ATMs. 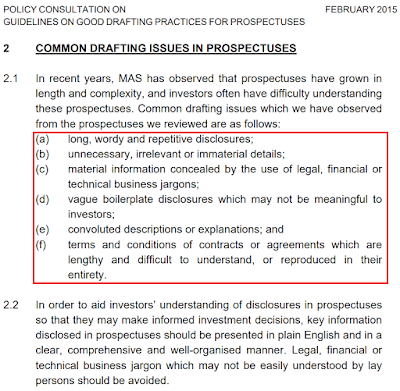 Let's compare the MAS Guidelines on Good Drafting Practices to the 197 page long Hyflux Offer Information Statement for the $500 million Perpetual Securities issued in 2016. I don't think the Hyflux Offer Information Statement in 2016 provided any sort of easily readable disclosure of the 3 " illusions" stated above which would facilitate investors' understanding of the true state of Hyflux. This is called financial engineering whose only purpose , in my opinion, is to paint a rosier picture of a company. May 2016 - $500 Perpetual Securities offered for sale to retail mom and pops, retirees through ATMs. 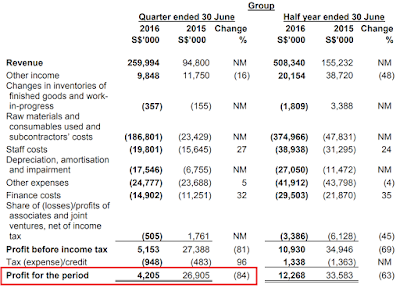 August 2016 - Second quarter results ( ending 30 June 2016) released showing a plunge of 84% in profits. Olivia Lum blamed the weak power market for the woes of Tuaspring. It must be remembered that the power plant of Tuaspring went officially online on March 2016 and 2016 is the year when the USEP hit the all time low. Within 2 months from the official opening of the Tuaspring power plant, in May 2016, Olivia Lum completed selling the $500 million perpetual securities. This could have been the most opportune time to do so, before the second quarter, ending 30 June 2016, financial statements is out. As seen above, Hyflux was profitable in calendar years 2013,2014 and 2015 and this rosy picture is painted to whet the appetite of the retail perpetual security holders, hook, line and sinker. There was a short span of time between March and August 2016 for the perpetual selling to be done and sell she did, like hot cakes when it was upsized from the original $300 million to $500 million. 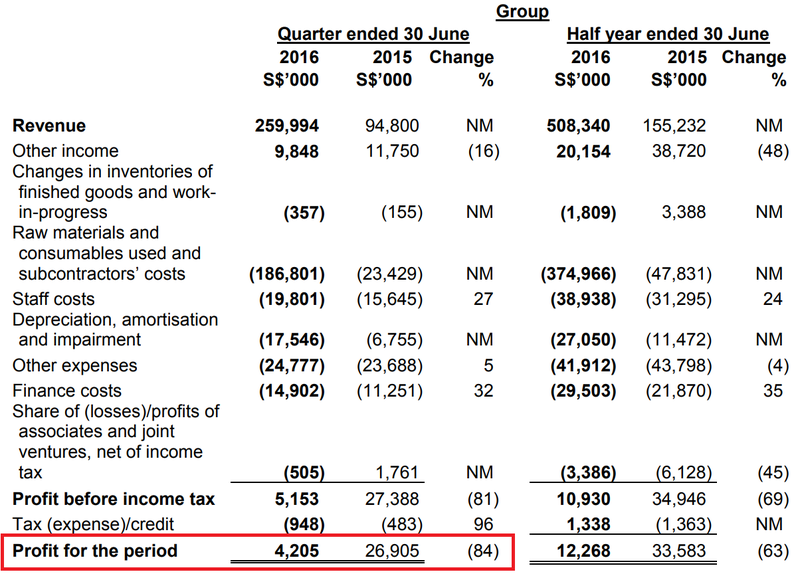 In August 2016, the 2nd quarter results showed a 84% plunge in profitability as shown below. However, the perpetual securities had already been successfully offloaded to the retail market before the disastrous 2nd quarter 2016 results is out. CHEERS! It is true that the extremely astute investors who have been very proactive in following the company's announcements could have sold their holdings after the 2nd quarter results were out. However, this is not the point. These astute investors would have sold it to fellow retail investors again. There was no way these securities could be returned to the company. 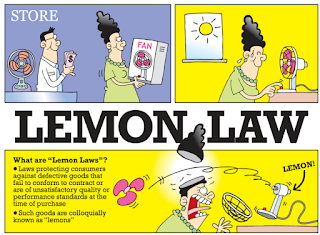 These toxic, " lemon" securities would still be floating about in the retail investor market, ensnaring other retail investors. "HOW MUCH DID HYFLUX BOARD KNOW WHEN THEY OKAYED RETAIL BONDS?" It still seems like a nightmare to me when some investors still had the mood to clap for her during the second townhall, still oblivious to what is really happening. When PUB is asked about Tuaspring's water capacity in relation to operational defaults and you are given such an answer. You know you are not dealing with a "commerical decision" anymore. It came as a surprise to many when Olivia Lum mentioned publicly for the first time to retail investors at the Townhall that only 10% of Tuaspring revenue is from water while the rest is from electricity. However, this was only mentioned after the court protection, so even if any investor were to do his due diligence on this new information, it is too late as Hyflux is already suspended from trading. Listen to this recording again. I think it is important to highlight some important milestone dates of Tuaspring, an Integrated Water and Power Plant. March 2016 - Tuaspring's power plant went online. Source here. This means that Tuaspring has already started earning revenue from treated water alone in 2014 and 2015 as the power plant only came online in 2016. However, i am unable to find disclosed information on Tuaspring's revenue in 2014 and 2015 in their annual reports or any corporate announcements on Hyflux website. 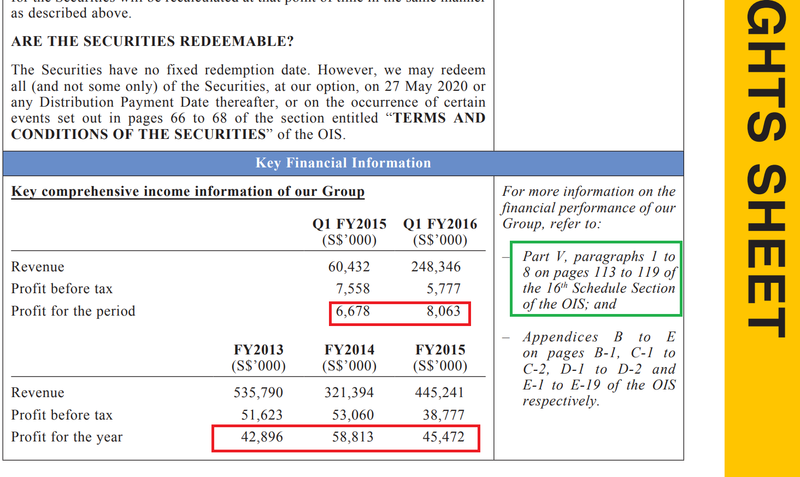 It is only in Annual Report 2017, where Tuaspring's revenue is finally revealed since Tuaspring is classsified as an asset for sale. However, how much revenue is derived from electricity and how much is derived from water is still undisclosed. This information on Tuaspring revenue is still not helpful at all to the investor who wants to find out the actual water utilization of Tuaspring. On Hyflux's website, Tuaspring's capacity is shown as 318,500 cubic metres a day. I am unable to find any disclosed information on Hyflux website or corporate announcements that Tuaspring was required by PUB to treat any other capacity. An anonymous member in Telegram group provided me with the audited ACRA filings for Tuaspring. This filings showed the revenue earned by Tuaspring in 2014 and 2015. Source here. You will have to pay up to $76 dollars to get these filings. It is very ridiculous that i am not able to find this information on the corporate announcements of Hyflux or in their annual reports. Imagine if a company has many subsidiaries, does it require one to pay up to $76 for each subsidiary to check their statements to see what is wrong? 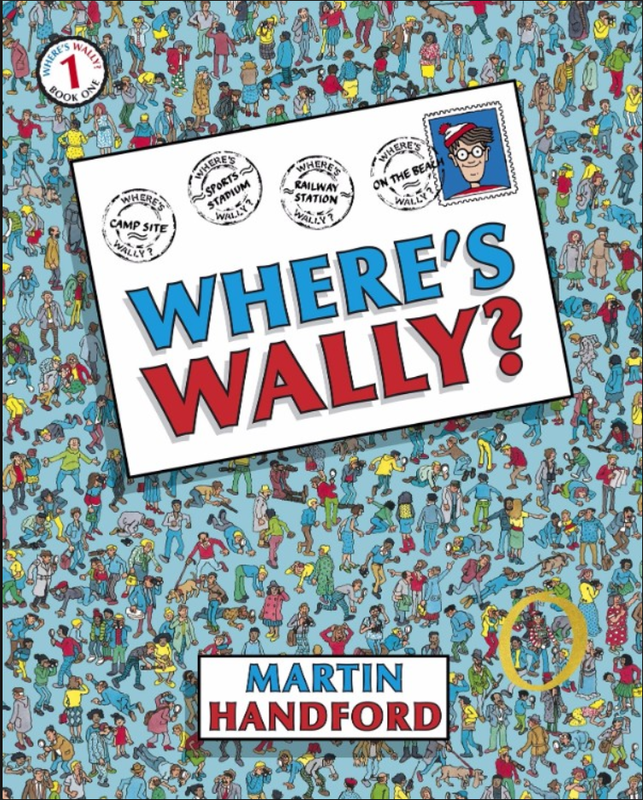 Besides, how does a mom and pop investor even know what to look for! As Tuaspring went online with the water business first in 2013, revenue from 2014 and 2015 should only be related to water revenue and not mixed together with electricity revenue like in 2016 and 2017 where the power plant came online. According to this source, the first year water price that is sold to PUB is 45 cents per cubic metres. Let's assume that this is the same water price in 2014 , 2015, 2016 and 2017. It can be seen above that the revenue from water and the capacity utilisation of Tuaspring is pretty consistent through 2014 to 2017, ranging from $13.3 million to $18.8 million revenue per year and 25.6% to 36.1% capacity utilization per year. It must be noted that in 2014 and 2016, the derived capacity utilization is even lower than 2017. Yet, PUB has stated that Tuaspring " has failed to provide the required plant capacity on multiple occasions". " The defaults started since 2017..."
But the utilization in 2014 and 2016 is even lower than in 2017! Some questions naturally arises from here. 1) Did Tuaspring fail to provide the required plant capacity as far back as 2014? 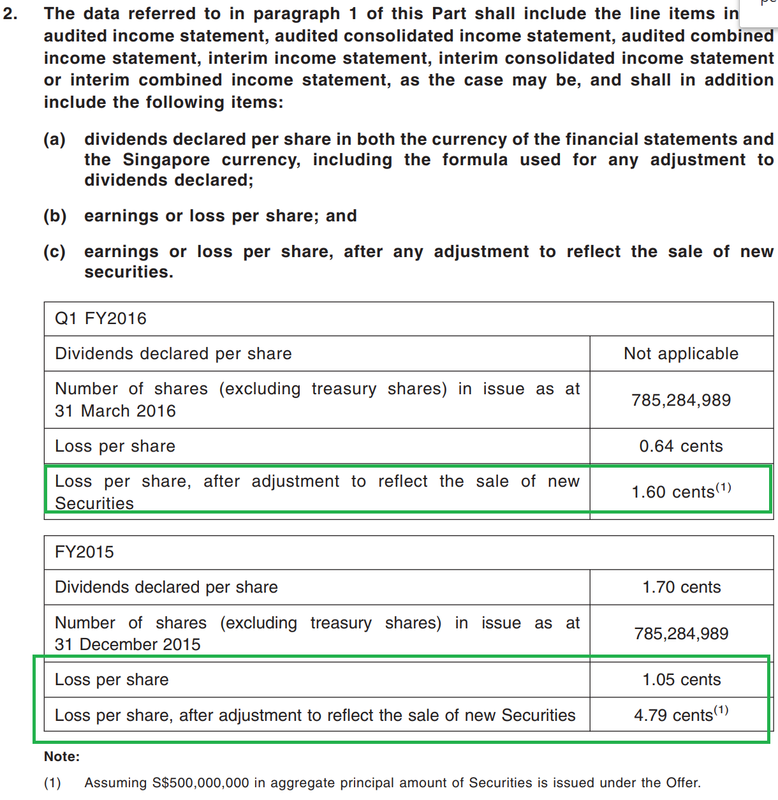 2) If yes, why did Hyflux continue to sell the $500 million perpetual securities to retail investors in 2016 knowing that there was already something wrong with Tuaspring and it being more than half the asset value of Hyflux ? Why wasn't this material information disclosed? 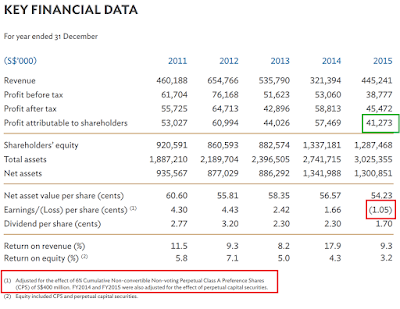 3) Why did PUB only state that it occured since 2017? 4) Another possibility is that if PUB did not require Tuaspring to run at 100% utilization and instead run at a lower utilization with sufficient spare capacity as standby, just in case we need it, is this disclosed to investors? How will any investors cover their cost of investment if indeed this was the case? I am not sure if it is a coincidence but in 2015 when Tuaspring capacity utilization is at its highest at 36.1%, 2015 was also recorded as one of Singapore's top 10 driest years in history. Source here from government website. May this imply that the revenue earned by Tuaspring is also affected by the climate? Who would have known! 5) In a Straits Times forum post published on 19 Feb 2019 titled " How much did Hyflux Board know when they okayed retail bonds?" . Did they know already that the company would most likely be doomed to fail but still issued to mom and pop retirees who are the last to be sold a Hyflux toxic security? 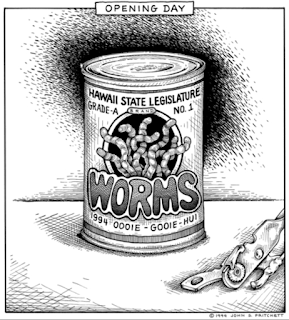 The more one digs, its like opening a can of worms. If material information is classified as confidential and not disclosed , how can any investor make any informed decision? 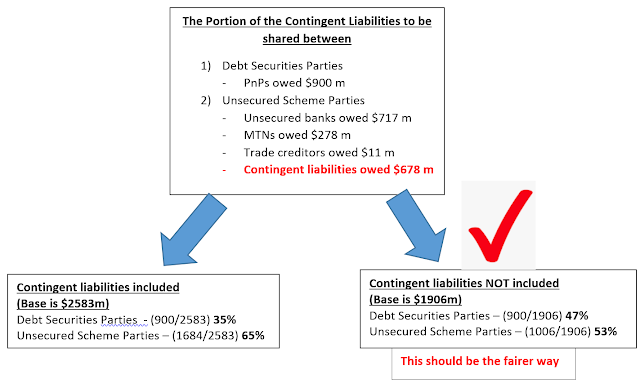 I think i have to correct the wrong impression that some people may have: that PnPs and unsecured banks/MTNs are sharing on a pro rata basis any of the upside that will happen if contingent liabilities were to be extinguished. A short answer is there is some sharing going on. But actually its a NO. It is not on a prorata basis. 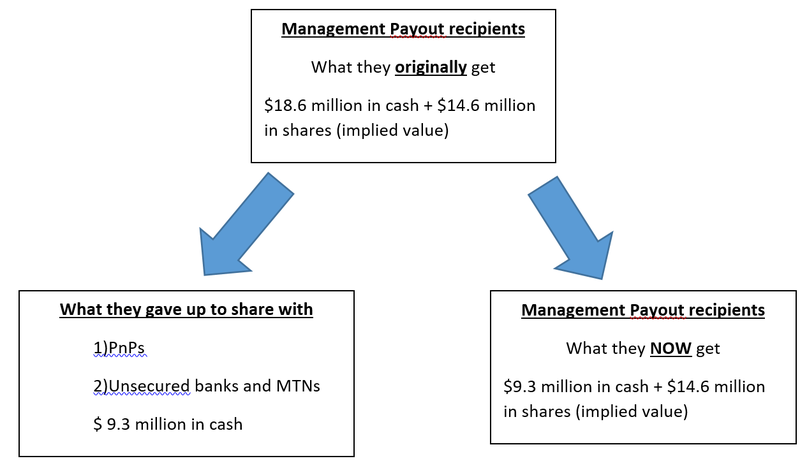 In my opinion, i think it can be quite misleading and many of the PnP mom and pop investers, especially the Pioneer or Merdeka generation may actually believe they are sharing with the unsecured banks on a prorata basis, making it seem fairer and hence making a wrong decision. The percentages % stated below are all based on the cash component held in escrow account as a standby for the contingent liabilities only. 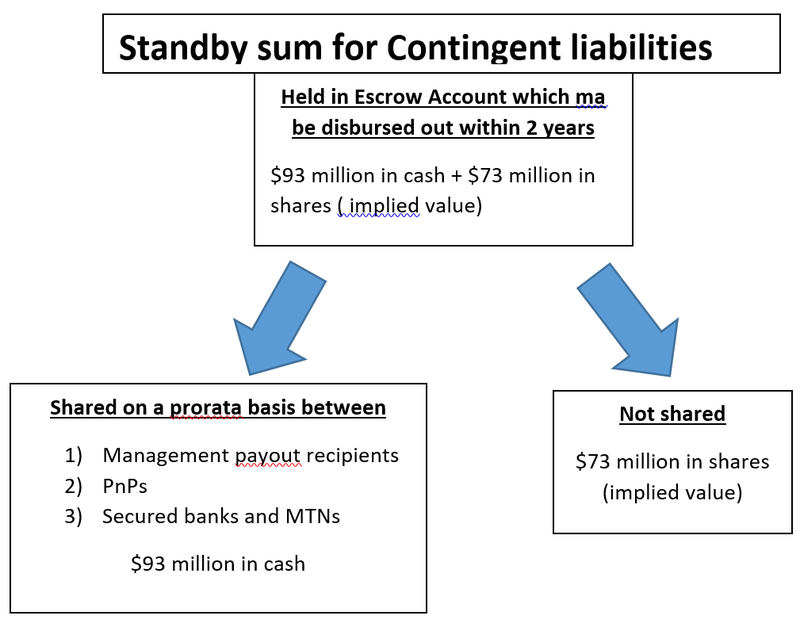 However, the amount held in escrow account as a standby for the contingent liabilities comprises of both cash and shares and not cash only. 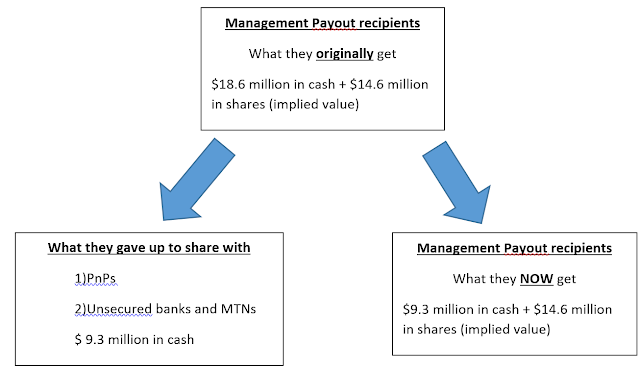 Regarding the reduction of 20% to 10% for the management payout recipients. As in the letter above, the %percentage is again based on the cash component. This means the project leaders who are taking these incentives are not giving up half of their incentives.Instead, the management payout recipients got 72% ( 23.9/33.2 times 100%) of what they got originally , instead of half which many people thought instead. Read how this mainstream media writes about this. I think it gives a wrong impression, in my opinion. 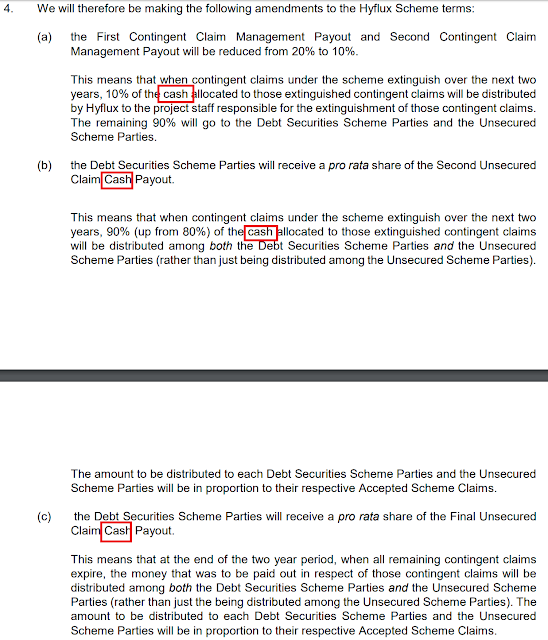 When the letter writes "pro rata basis" between Unsecured Scheme Parties and Debt Securities Scheme Parties, this pro rata isn't pro rata actually. It depends on what is categorized under these two Parties. Now that contingent liabilities that are extinguished are to be shared among these two parties BUT these contingent liabilities are categorised under Unsecured Scheme Parties to enlarge their base. 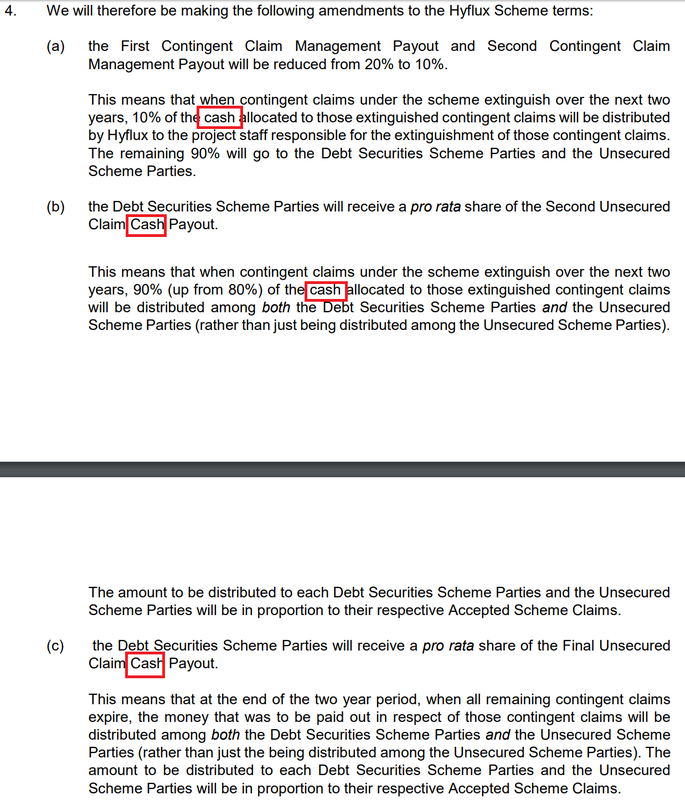 I reiterate again that contingent liabilities are not actual claims as they may not even happen at all. These contingent liabilities should not have been classified under Unsecured Scheme Parties in the first place at all because it "artificially" inflates their share of the extinguished contingent liabilities, from 53% to 65% and reduces the share for the Debt Securities Parties (PnPs) from 47% to 35%. I think its very unfortunate that a simpler way of providing the information was not given. It may also be construed by some skeptical people that it is meant to mislead the more helpless ones to think that this is even near to a fair deal at all. I think i will give Hyflux the benefit of the doubt. A much simpler way of presenting these scheme has to be shown. This is important as the bulk of the target audience 34,000 of them have many many pioneer and merdeka generations among them. It is already a challenge to read in english or read at all given their poor eyesight for many of the chinese educated ones. To be honest, i have immense difficulty reading and understanding the letter too and had to re-read it many times and i am not a financial advisor. I urge greater clarity from Hyflux with simplified terms so that many of the 34,000 can make an informed choice on the 5th of April . I wonder why they planned it on Qing Ming Festival a.k.a Tomb -Sweeping Day,.